Autumn Equinox- The Season of the Witch Begins! Hello, autumn is in the air here in the Mid-west. For the past several days we have had the a/c off and the windows open to let in the cooler air. In the morning when I get up before sunrise to go jog or walk, I have been wearing workout pants, long sleeve shirts and hoodies. Oh, its so nice to get a break from the brutal summer temperatures we have had this year. Now, If we could just get some rain in my part of Missouri. Its been dry for far too long. 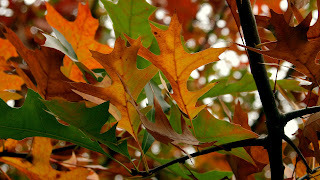 However, I have been starting to notice that some trees are beginning to show a few leaves with some autumn color. The butterflies are starting to migrate south and my chrysanthemums are setting buds and getting ready to bloom in the next few weeks. My tomato plants are making their last push for producing fruit, and my pumpkins… well no matter how much I have watered them I think the heat may have done them in. Right now nurseries are temptingly full of mums just starting to open… Oooh I want to plant some more mums in the gardens in a big way. My favorite season is about to begin! I adore the autumn. Spring runs a close second, but there is something about the autumn that I find to be especially enchanting. Way back in 2004 when Llewellyn approached me and asked me to write one of the Sabbat series books, I jumped at the chance. The funny thing was when my first book Garden Witchery first was contracted in 2002, I had said to my husband, “Boy I wish I could have a crack at doing one of the Sabbat books. 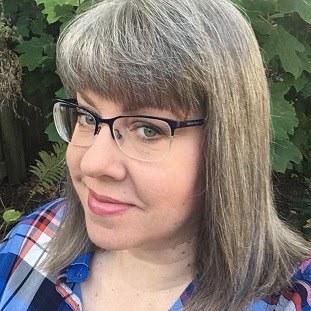 I would love to do the Autumn Equinox sabbat…” He smiled at me and told me that as a new writer, maybe I should slow down, and not get ahead of myself. So I sighed, dreamed my writing dreams, and let it go. When I sent in a proposal for Cottage Witchery in 2004, to my surprise my editor at the time, Natalie, said to me, “We really liked the Cottage Witchery book, but I want to talk to you about something else…” That something else was a request to write a new version of the Autumn Sabbat book. So I was contracted for two books, on the same day. I still think this book has the prettiest covers of all 12 of my books Well okay, I haven’t seen the cover for “Seasons of Witchery” yet… "Seasons of Witchery" comes out in May or June of 2012. But I stand by Autumn Equinox being my best cover. Last year I even found a seasonal flag for the fall that looks very, very similar to the cover art of my book. You betcha I snagged it! Here is the official description of my book, Autumn Equinox: The Enchantment of Mabon: "Mabon, Feast of Avalon, Cornucopia, Harvest Home, Festival of the Vine . . . there are many names for this magickal holiday that celebrates the autumn equinox, the first day of fall. Ellen Dugan takes a fresh look at this "forgotten" Sabbat and demonstrates how to make the most of this enchanting season. Featuring craft projects, recipes, enchantments, and valuable information on harvest deities, Autumn Equinox offers countless ways to bring fall magick into your life. Learn to create witchy wreaths, cook seasonal foods, put together a homemade centerpiece, make herbal soap, and practice spells and rituals using easy to find, natural supplies. This new addition to Llewellyn's Sabbats series also provides magickal correspondences on harvest deities, herbs, plants, and foods for those who want to create their own autumn spells and charms." 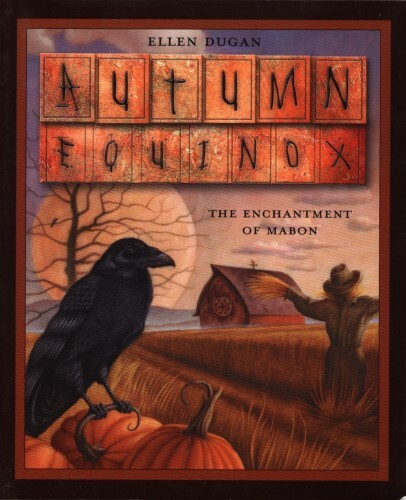 So while we all start to enjoy the fall season, the cooler weather and (hopefully) some autumn rain, check out my book, Autumn Equinox. This book is not just a one day book, as in, (Okay, I looked at in on the day of the sabbat- now I will put it back on my bookshelf until next year- kind of book.) There are ideas and plenty of fall-theme magick included to take you through the entire bewitching season, from September through November. 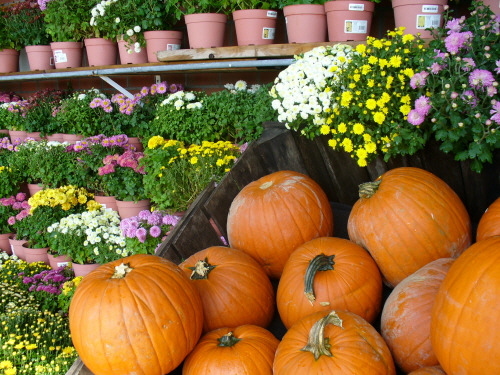 So enjoy those cooler temperatures, the longer nights, the blooming mums and the autumn decorations! Put up a scarecrow in your yard, start a leaf watch and pay attention to the signs of the autumn season as they emerge! The season of the Witch is beginning! I love this book - it was one of the first of yours I snapped up. I'm going to take it off the bookshelf today and start re-reading it! I have several of your books and I do agree the Mabon has the prettiest cover. Can't wait to see your new book next year. Love this book!!! I think it is one of my favorites. Autumn is also my favorite time of year. Planting late blooming mums in a couple of weeks. Silly excited about that. It's not too hot and not too cold and in Autumn there are still lots of flowers and the wonderful leave colours. In Spring everything starts again with wonderful, lush, green leaves. Have a wonderful weekend and enjoy the beginning of Autumn ! !